Accidents happen, and for 55 years Kansas Jack has been helping shops repair even the most damaged of vehicles. As one of the most trusted names in the collision repair industry, we understand the importance of fast and accurate repairs. The Tru-Point Sonic 360 is a computerized electronic measuring system that relies on ultrasound technology for dramatic productivity improvements and the industry’s best speed and accuracy. The Tru-Point Sonic 360 provides live “measure-as-you-pull” functionality that virtually eliminates costly rework. The Tru-Point Sonic 360 uses ultrasould technology to collect measurements and track your repairs. Emitters on the probes are attached to the vehicle at specific points and send ultrasonic signals that are received by high-frequency microphones located in the light-weight extruded aluminum beam. The results are compared to manufacturer specs and any problem areas are identified automatically. This leaves the operator free to concentrate on straightening, not on how to collect measurements. A technician favorite that improves productivity, view line art of actual vehicle images which display attachments points while the technician moves through the attachment process. The all-new magnifying glass function allows the technician to zoom in on attachments points for an increased visual interpretation and make informative decision in the repair process. Live measurements enable real-time feedback of your pulls, saving time and putting more money in your pocket. Three available display options of these measurements cover every technician’s preference. The XYZ coordinate option provides easy-to-read distance & direction. Graphical displays of XYZ coordinates and of net pull angles also available. Maintain consistency with OEM specs, view Technical Service Bulletins and access vehicle repair information from OEM’s worldwide via the Tru-Point Sonic. (EAK0289J86A) The VIN Scanner allows the technician to scan the Vehicle Identification Number and automatically input it into the Tru-Point Sonic 360, saving time & eliminating the possibility of operator error. Customized reports meet your shops and insurance companies requirements. View and print a quick comparison of the vehicle damage versus its repair, add vehicle damage pictures and repair notes, and build up a damage or repair unit estimate! Access our EDATA electronic vehicle dimensional point-to-point specifications of both upperbody and openings. Maximize your profit potential by using the Vehicle Pre-Delivery checklist to offer services beyond collision repair! Additional Features: Point-to-Point Measurements, On-Screen Job Note Pad, Embedded and Context-Sensitive Help Files, Multi-Layered Vehicle Graphics (Allows peeling and see-through functions), and On-Board Log (Track system maintenance, inventory audits). Unleash Your Collision Shop’s True Profit Potential! 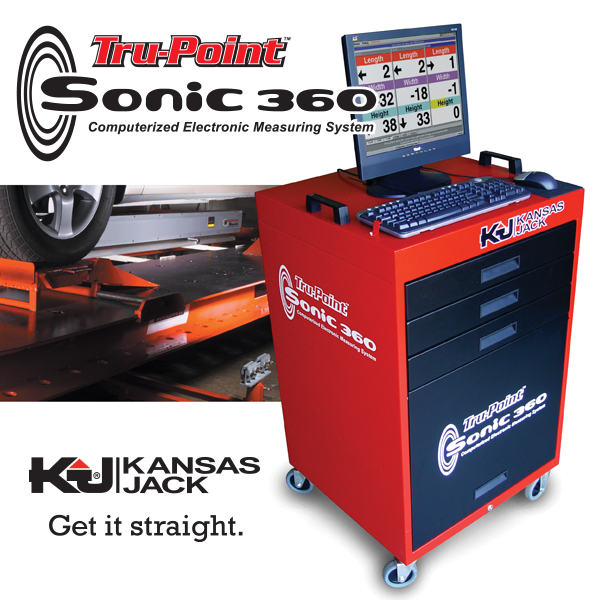 Tru-Point -Sonic 360: Computerized Electronic Measuring System by Kansas Jack.